Do you value the aesthetics of a car when you look at it? Do you enjoy the thrill of rapid acceleration or the noise of a revving engine? What about handling a sports car through tight turns, squeaking the rubber on the tires? If you value practically any of these things in your driving experience, then the Porsche Carrera 911 is for you. 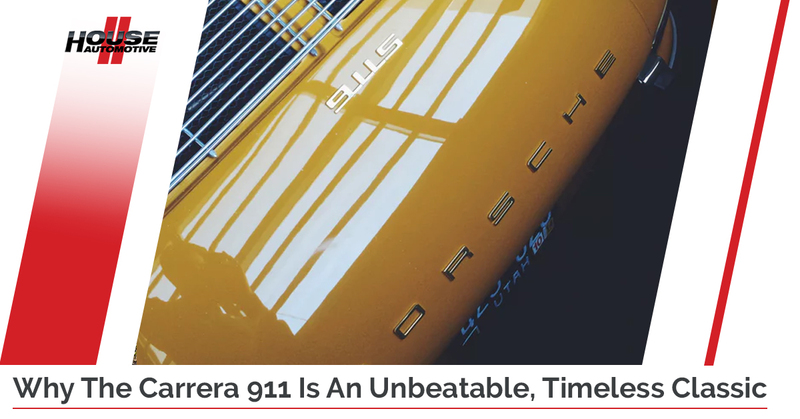 This vehicle is on every automotive enthusiast’s list of top things to buy and drive before the end of their life, and unlike many other makes and models of cars, the core design of the 911 has only changed very slightly since its inception. As we ramble on about the Carrera 911, it’s becoming more and more obvious that this blog post is a 911 appreciation post, and it’s true. What else would you expect from a local Porsche service center here in Pasadena? We work on many different kinds of Porsches, but Porsche 911 service might be one of our personal favorites. If you’re concerned about Porsche Panamera service, Porsche 996 service costs, Porsche Boxster service and more, don’t worry! HOUSE Automotive can handle all of your general Porsche service needs in a timely and efficient manner. Visit here to learn more about our general services. Now, let’s take a closer look at why we love this timeless, high-performance machine. Since the inception of the Carrera 911 back in 1948, its appearance has evolved gracefully and subtly. Porsche is widely considered as the most successful automobile brand in motorsport, and so you can really put the pedal to the metal (HOUSE Automotive does not condone reckless driving) and push the 911 to its limits and still get superior performance. Unlike many vehicles, the 911’s engine is behind the rear wheels. Why? A Porsche engineer might take years to thoroughly answer that question, but the 911’s engine displacement comes down to the weight distribution. Equal weight distribution makes for extremely efficient acceleration and handling, which are crucial aspects of successful racing and motorsport. So if you’re at all familiar with racing, as we just explained, you’ll know how important weight distribution is in a car. Indeed, sports car designers agonize over where each ounce sits within the chassis because a balanced car corners easier and faster. Early Carrera 911s carried the bulk of their weight on the rear axle, which required delicate braking and accelerating, nimble hand maneuvers on the steering wheel and a stream of prayer (or expletives) to race around a corner at high speeds. Many high-performance exotics or ‘hypercars’ like Ferraris and Lamborghinis are drop-dead gorgeous and mind-blowingly fast, but they usually come with a distinct drawback: You can’t drive them. Well, you possess the ability to drive them at any moment and in any conditions, but what it comes down to the owner is the decision of navigating their $300K+ dream machine in an urban, traffic-riddled environment. Even long drives on country roads present problems with constant rock chips and bugs flying into the precious paint. But the Carrera? For a fraction of the price of these other supercars, the consumer is getting the same (or close) level of performance and speed with a car that’s actually more driveable in a casual context. While the 911 Carrera still turns many heads, especially motoring enthusiasts, you can still drive one around and be somewhat low-key. A hypercar draws a lot of attention, and can bottom out easily due to the often ridiculously low clearance these vehicles come with. So, all things considered with the 911, it deserves some praise as a practical vehicle that you can truly drive every day and crack the biggest smile on your face when you downshift and put your foot down on the gas (we get all too excited just writing about this, if you couldn’t tell). High-performance vehicles require high-performance maintenance – it’s no industry secret. When you visit HOUSE Automotive to get your Porsche service completed, you’ll see our love and passion for these wonderful machines come out. So, when you’re thinking about ‘Porsche service near me’, go to the pros who care about your 911 or other model of Porsche at HOUSE Automotive in Pasadena. Contact us today! Service Your Carrera 911 With HOUSE Automotive!